When I reviewed the original Vesper in June 2013, I noted how the lack of sync and an iPad app were problematic for my workflow. Vesper was an elegant and fast note-taking app that combined images and text; finding this combination in a lightweight utility can still be surprisingly difficult today. I started following the development of Vesper 2.0 with sync, and today the app has been updated with full support for iPad and iPhone landscape mode. I’ve been testing this new version of Vesper, and I’ve found myself using it a lot more thanks to its native iPad version (big surprise, I’m sure). There’s nothing dramatically different about Vesper in terms of interface and interaction – you still collect text and images with smooth animations and the ability to add tags; the iPad counterpart builds on this tradition. You can view assigned tags in a sidebar on the left and add one image to each note; the main content area is obviously larger on the iPad; and, you can search notes by swiping down to reveal a search bar. Overall, though, it’s still the same Vesper, only on more devices and in more orientations. I have two specific use cases for Vesper in 2015: grocery/IKEA lists and videogame notes. I found the latter particularly well suited for the new Vesper: whenever I’m playing a game (pictured above, shots from the excellent Grim Fandango) and no matter the device I have available, I can open Vesper, take a picture, add a thought or a comment, and go back to the game. I could do the same in Drafts, but it’d only be text; I could do the same in Evernote, but it wouldn’t be as fast (thankfully, Vesper doesn’t have prompts asking me to enable Work Chat). I appreciate Vesper’s design (as I did two years ago) because it wants to do a couple of things extremely well and those happen to work for me in two scenarios that I value on a daily basis. Sync between iPhone and iPad was fast in my tests and I like that I don’t have to think about progress bars, upload times, or, generally, “managing” sync. I’m even happier to note that Vesper is a good iOS 8 citizen, with a native share sheet that lets me share text and images with iOS 8 extensions. I especially like the fact that Vesper passes both the image and text to extensions – in apps like Workflow, I can put together a series of actions that parse image and text from a Vesper note independently and send them elsewhere, which makes it easy to get my content out of Vesper and do something else with it. Two years ago I noted that Vesper was an elegant and purposefully unspecific destination for thoughts. I stand by that comment and I’d add that its design lets me concentrate on saving thoughts and photos instead of fiddling around with the app. 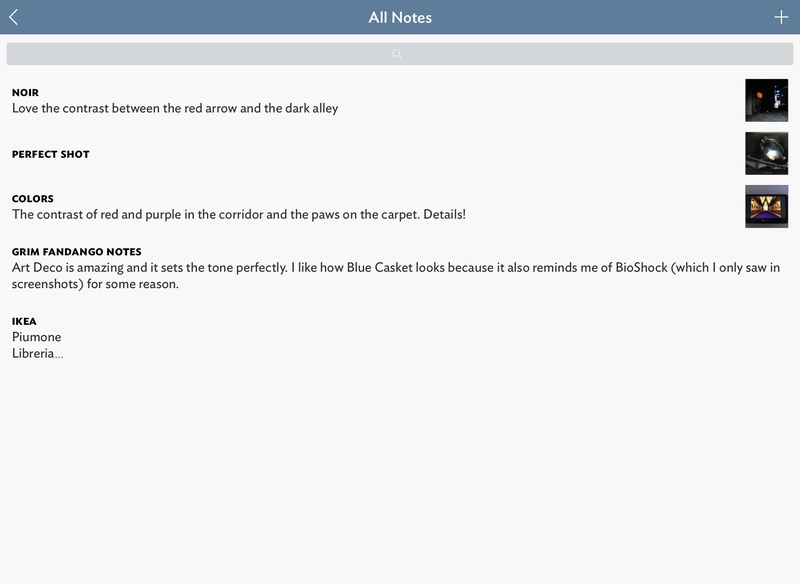 The iPad app works well with sync, and I enjoy the ability to quickly add notes from all my iOS devices. The latest version of Vesper (2.005) is available on the App Store (with a new pricing of $9.99, discounted at $7.99 for a limited time).